There is little doubt that the guidelines, if followed, would have produced a very tasteful well-mannered result. However, when I was recently asked to review them it was clear that the colours that were recommended had little to do with eighteenth century practice. 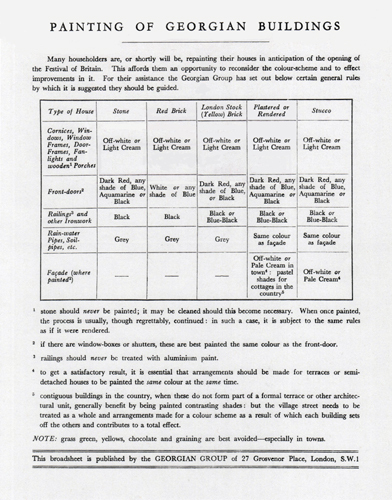 According to my colleagues at the Georgian Group, questions on paint colour remain some of the most frequently-asked even now when most paint manufacturers seem to be producing ranges of historical colours. Of course, there is little point in offering these colours if one is not prepared to explain how they might be used, but that does not seem to be a concern. The framework of the Georgian Group guide is a good one and I thought that it might be useful to offer alternative suggestions based on nearly thirty years research in the subject. 3) The analysis of painted surfaces in / on numerous historic buildings. To illustrate these I will offer a few examples of each and then show a few images of good practice. Some years ago I completed a research degree that focussed on The Methods and Materials of the House-Painter in England 1650-1850. As well as writing a thesis on the subject I investigated the house-painting trade in London and produced an annotated bibliography of works dealing with paint and colour. The sort of works that I pored over ranged from seventeenth century house-painting manuals to early works on colour theory. In recent years I have slowly drifted forward a century and have written extensively on paints from the 1930s and looked at recommended colours for post-war factories and offices and Ministry of Works colour schemes. Some of the areas covered have been fairly off-beat, such as war-time camouflage colours and the colours employed to paint Henry VIII’s heraldic beasts. Images such as this are rare, and this is a bit late for help with eighteenth century colour, but the topographical drawings and watercolours by George Scharf and his father George Johann Scharf are some of the most informative of their type. 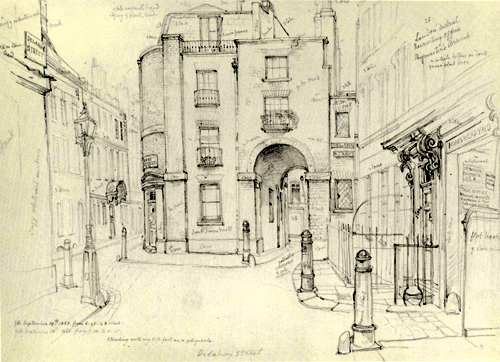 In this drawing of Delahay Street of 1863 one can see that the doors were green, the bollards “brown-black” and the walls on the left a “dingy whitewash”. The earliest set of photographs that I can remember being of use to support my analysis of the paint were those showing the construction of the Royal Albert Bridge in 1859. The hitherto unexplained pale colour seen in the black and white photographs was in fact the (glass-reinforced) white layer that I found. The process of paint analysis can be found elsewhere on this site. It is a very useful tool in the dating of surfaces as well as providing information on the colours that were used. The lump of paint above was taken from the external timber cornice of a house in Westminster that was built in 1705. Information provided from this, when compared with samples taken from the interior of the house, enabled the dating of each of the decorative schemes, the date of the reglazing of the windows and it confirmed that the doorcase was original. 1 Stone should never be painted; it may be cleaned with care should this become necessary. Once painted the process is usually, though regrettably, continued. In such a case it is subject to the same rules as if it were rendered. 2 If there are window-boxes or shutters, these are best painted the same colour as the front-door. 3 Railings should never be treated with aluminium paint. 4 To get the best result, it is essential that arrangements should be made for terraces or semi-detached houses to be painted the same colour at the same time. 5 Contiguous buildings in the country, when these do not form part of a formal terrace or other architectural unit, generally benefit by being painted in different colours. However the village street needs to be treated as a whole and arrangements made for a colour scheme as a result of which each building sets off the others and contributes to a total effect. A subtle point, but notice the off-white on the left hand window and compare it with the brilliant white paint on the right hand one. Apart from being garish, brilliant white goes a cold bluish grey when it ages. 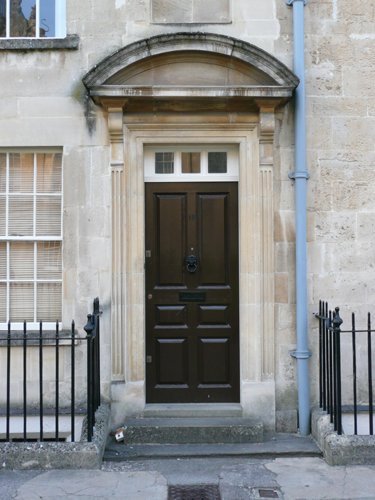 The dark reddish-brown is appropriate on the front door of this small eighteenth century house in Beaufort Square, in Bath. The door furniture is largely black and the external joinery is off-white / a pale stone colour. The down pipe is grey in simulation of lead. The railings would not have been black until the mid-twentieth century – a grey or a bronze green would have been better. You can read more on the treatment of external ironwork in one of the papers at the bottom of this post. Further thoughts on the treatment of front doors can be seen HERE. 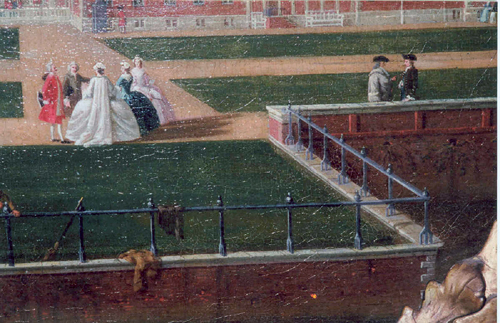 This sort of detail is not often shown, but one can clearly see that the railing are grey (often called Lead Colour) in this painting, which hangs in the Court Room of the Foundling Museum. 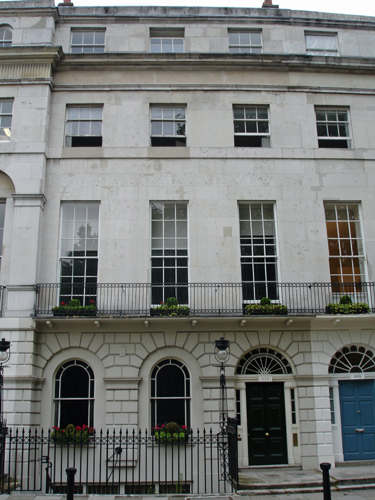 The exterior of the Georgian Group’s Headquarters in Fitzroy Square, London has been painted in a near text-book fashion. The door is bronze green and in a gloss paint (see below) and the external joinery has been painted in a pale stone colour. The door knob might best be painted black rather than being of shiny brass, but that is a small point. In a perfect world the railings and lamp would be grey (as cross sections revealed), however one then hits the problem of being the only house in a terrace ‘marching in step’. There is little point in painting railings in a different colour to ones neighbours if it disrupts the overall uniformity of the terrace. If you look carefully at the photograph of the façade of No. 6 Fitzroy Square you might notice that the rusticated ground floor has been painted to resemble the Portland stone above it. In order to do this I took a series of colour measurements using a portable spectrophotometer – the right hand photograph above shows this process being carried out. 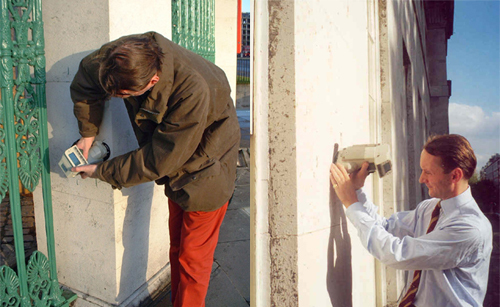 The left hand one shows the gate piers at Apsley House being measured so that paint could be matched to that stone. 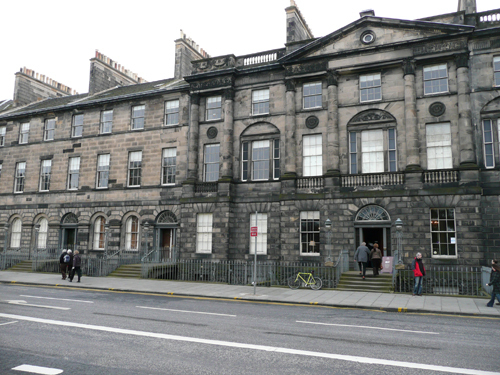 Some years ago I had the opportunity of carrying out the paint analysis of six adjacent Robert Adam buildings in Charlotte Square, Edinburgh. The paint layers on the exterior railings showed how they had originally been painted grey, only changing to green in the mid nineteeth century. As these buildings form the south side of the Square we were able to paint them all grey without problem. By permission of the Library of the London School of Economics. For some thoughts on the painting of the interior of Georgian buildings you might be interested in The Hierarchy of Paint Colour in Eighteenth Century Decoration. 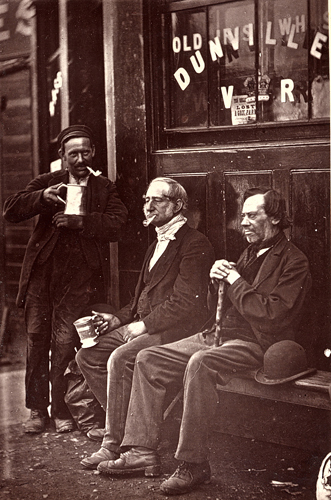 Photograph by John Thomson from Spitalfields Life © Bishopsgate Institute. By permission of the Library of the London School of Economics. Although I have been a Committee Member and Trustee of the Georgian Group for twenty years, these are my personal recommendations and not necessarily those of the Group. Thank you very much for your work on this. It is valuable to be able to pass on to owners of Warwick houses of the post 1694 fire rebuilding advice which is based on historical evidence rather then current taste or belief. Not at all. Thank you. It is so important to work from evidence and to always question. I could read these posts all day! Amazing work, and all taken from a simple paint sample. It’s a great shame that more is not being done to preserve and maintain original colour schemes on period propertys, rather than the Black & White curse that we seem to have. It would be far better to see more done in an original & period style. Thanks Adrian. The key thing is to find out what was done, but then to think carefully before the redecoration. One must ask oneself – what would be most appropriate? Your article is such a help! I own a C.1830 3 bay Rubble-stone Georgian, and am in the process of painting it. I want to do so correctly. I am still stuggling with the door colour, though. If you respond to this note I shall send you an email with a photo of the house and would be much obliged for your opinion! Fred, by all means send an image. However, bear in mind that I know nothing about the decorative conventions of your part of the world. You also don’t say which period of the building’s life you are hoping to suggest. I take it that there will have been a number of external changes over the years and it may be that a 20th century colour may be more appropriate than an early 19th century one. What a wonderful site, and how refreshing to find advice on what colours should really be used, rather than relying on paint manufacturers. One thing I am struggling with at the moment though is what colour to paint the doors on our outbuildings. Everybody tells you what colour you should paint your front door but nobody seems to bother with the back of the property. We live in a 1778 ex-vicarage, built in red brick with some 1800′s additions using a slightly lighter yellow brick. I gather the bricks are East Yorkshire and typical for our area. We have outbuildings, “outhouses” if you want to use the Yorkshire word, and as we have used F&B in most places our thought was that we would paint them either Tanners Brown or one of the Carriage or Studio Greens, but are concerned that it may end up looking too Victorian, or worse still that the greens may give it a 1950′s feel. Is this something that you would mind giving me an opinion on please as visitors tend to use the back of the property for access due to parking and so this is actually what everybody sees most. You are quite right. Larger buildings, certainly those with outbuildings, would often have a different colour on the external joinery to the front door. This was generally what was termed a ‘Common’ colour – an inexpensive, lightfast colour for practical purposes. Frequently, if in an area with a source of available local pigment, that would be used and the same sort of colour would be employed on many buildings under different ownership. The colour range in the 18th century was slightly more limited than the 19th, although the conventions were very similar. You may be surprised to learn that the ‘Common’ colours continued in use until WWII. Some years ago I was employed by English Heritage to research the paint colours used over the last 300 years. This was done in conjunction with Dulux and a further exercise was carried out with the Little Greene Company. Those two ‘Heritage’ ranges are the only ‘mass market’ colours that have an academic background. However, you have to choose carefully because they have both been amended since I did my work. As far as the way ahead, I would first establish which period you are trying to suggest; look at one or other of those two ranges and choose a colour that suits the local conditions. Thank you Patrick, so it seems that our choice of paint was the wrong one all along! We will now look at Dulux and Little Greene and choose from there. No. It’s never wrong if you establish first of all what you are trying to do and stick with it. Otherwise you can just decorate it in a manner that pleases you (without making any claims to authenticity). This is very interesting . 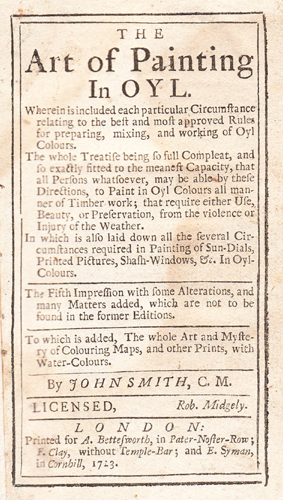 I am wondering when compared to the papers and paints shop – how paint was sold in the 18th century ? Were there paint shops ? was paint sold in clay pots ? or did builders / house painters mix it on site ? what exactly is the history of exterior paint as for instance supplied for the painting of sash windows ? I wondered if you could give us some advice regarding authentic colours/suppliers that would be suitable for painting the front exterior walls of a Georgian town property that is rendered.There are a few decorative plasterwork features under a window that we wanted to pick out and also wonder what would be the best colours to choose. Many thanks for referring me to this page. I have learned a great deal! I read this page with excitement and enthusiasm. Your research is exemplary and thorough, and an excellent source for how a Georgian house should be approached. I have emailed a link to one of my customers who is umming and ahhing about his house’s paint colours, which at the moment look gaudy. This may well help me seal the job of painting it!!! Thank you. Thank you for this post, its very useful, do you have advice on painting of the internal wood work? we have recently moved into an and old Georgian vicarage where the doors and shutters are a stripped wood (the frames white) . Is this the correct finish? Without seeing it one must be cautious with a response. 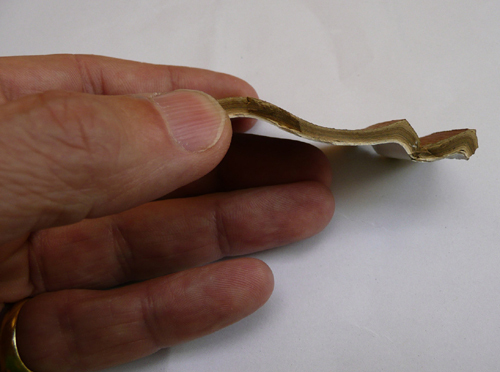 However, if the wood is softwood, e.g. pine, then it would have been painted. We are renovating an old vicarage in Somerset, the back part of which dates back to the 16th century. The front part of the house was added at a later date. I am struggling with what colour to paint the front door and wondered if you could let me have some advice.. The property is made of red Quantock stone. I can email a photograph if necessary. I have Ian Bristow’s 2 books on historic paint colours in British interiors … do you know if there is … or have you published, a comparable book for exterior colours … particularly for windows? I don’t know of such a work, but some aspects are dealt with here – http://www.scribd.com/doc/11349303/The-Colour-of-Chelsea (for Chelsea read many parts of London and other cities). I am not sure that I agree with the conclusions drawn by Patrick Baty on the colours of Georgian window frames. At my own family home, Croft Castle, in Herefordshire, there are discarded Georgian window frames. These window frames have been kept in the cellars ever since the front of the castle was remodelled in 1913 and they were painted a reddish brown. St. Johns church, Downshire Hill in Hampstead dating from the 1820s was repainted after extensive internal alterations and work. English Heritage insisted the Georgian windows were painted a dark brown. Take a look at the English Heritage publication, ‘Lost London’. Are there any white window frames? As a teenager in London, and very aware of architecture and the exteriors of houses, I never saw a house with white windows: there were cream, dark green and brown windows and doors were always a dark colour. White windows came into fashion in the 1960s when London became a cleaner place. I have an end of terrace on Kew Green and would like to paint the railings grey instead of black. I am trying to find out the exact shade of grey would have been used on the past but cannot find anything beyond “grey” mentioned anywhere. We are working on an 1829 building in North London, yellow stocks. The whole building appears to have been given a red wash, across bricks, joints, brick arches. Do you know what type of colour wash might have been used? Thank you. It is probable that it was a mix of red oxide pigment in limewater. That was the standard way to even-out the colour of bricks. We have recently stripped our Georgian front door and surround back to bare wood. In doing so we have discovered that the door (very narrow) and surround were originally painted the same colour…initially light green, then dark green, then a brick pinky red. The house is red brick. In old black and white photographs of the street there were many houses with the doors and surrounds painted the same colour. The street now looks stark with an overwhelming use of 80s brilliant white paint. We have noticed that the houses in Spitalfield (Fournier St etc) tend to paint the surround and door the same colour and would like to understand if this was a trend in the Georgian period? I hear of your observations, but unless one examines a cross section of the paint sequence using a microscope you won’t quite know what you have revealed. Doors tended to be painted differently to their frames, but I have found a couple of examples in Edinburgh where that wasn’t the case. Those same doors and frames then reverted to to two different colours. It all depends. The treatment of houses in Spitalfields is not an accurate source of early information. Hi Patrick, I live in Barnsbury, London. An area well known for its late Georgian/early victorian squares and terraces. It is interesting to read your work. The only issue i have is with your recommendation for windows being off-white. In all of the historical etchings, paintings and photographs I have seen of Georgian houses in London the windows were painted a dark colour; black, brown, dark red. I was told that there are two reasons for this. 1. London was a dirty place and white would never stay white. 2. Windows were painted black to disguise the fact that the windows were in fact panes. This gives the illusion of a larger window and more of a defined void to contrast against the stucco surrounds. Large single pane windows were not possible at the time. I couldn’t disagree more. Over the last 38 years I have taken samples from many hundreds of exteriors – throughout the country, but principally in London. 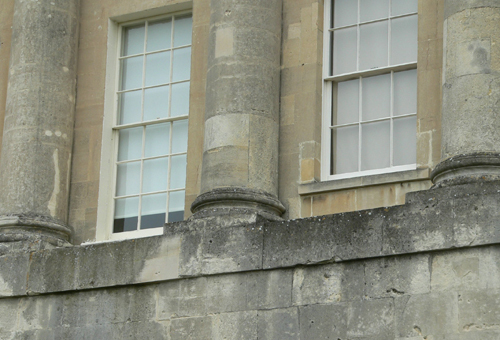 The evidence from the paint cross sections is that off-white (otherwise know as ‘pale stone colour’) was the predominant colour. One often finds dark colours in the last quarter of the nineteenth century and sometimes through to the ca.1920s. This applies across the board – from the humble terraced house to the Royal palace. I wonder if you could help me…. I have come across a reference to ‘mourning paint’ used on a house of c1825. I think it is referring to a darkish red oxide colour on the stonework – that has mostly now disappeared. Is it the limewater wash you refer to in a reply? And if so, why would it have been used on a house whose stone is all from the same period and wouldn’t have needed unifying? And if it was just for decoration why was it, or would it, be referred to as ‘mourning’ paint? Thank you very much indeed for your intriguing question. I have not come across this at all. Perhaps it is a coincidence, but there is a reference to Copperas being used in the cloth industry – as a source of black dye which could be strengthened with oak galls to produce an intensely black colour. It was therefore greatly in demand for the common range of garments and was essential for mourning clothes. However, this is nothing to do with red oxide. I would love to hear if you come across further references. There are some etchings here from 1750 that very clearly show London squares with black windows. Could it possible be that off white was a colour used in the countryside away from the pollution? Not at all. You are taking these too literally. Apart from anything, black was an incredibly slow-drying pigment and to paint an external surface with a paint that stayed sticky for days on end made no sense. I can show you countless photomicrographs that show the early sequence of off-white paint schemes – never dark. It is essential to review a whole range of sources before coming to a conclusion. Pictorial interpretation is one, although there is little enough source material in the early days. Documentary sources – in the form of painting specifications; painting manuals; diaries and letters is another. However, physical evidence gained by carrying out microscopic examination is the most reliable. I would be very wary of making ones mind up on the strength of a single early photograph.